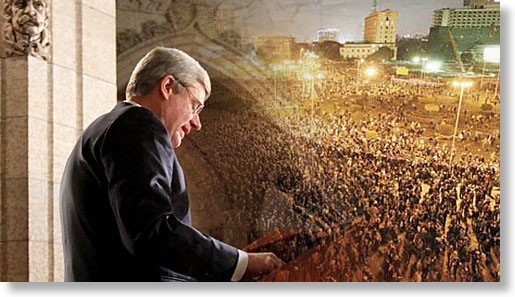 The Feb. 12, 2011 Leader Post “Ottawa reacts to resignation” (Egypt’s Mubarak) has several quotes attributed to Prime Minister Stephen Harper. Now, let’s examine Harper’s own record as to democracy, who decides, and free and fair elections. In 2006 Harper's Conservative government, in the middle of the 2006 ongoing Canadian Wheat Board (CWB) elections unilaterally removed 16,000 wheat and barley producers from the voters list. July 2007 Harper's Conservatives, through a illegal Order-in-Council tried to strip the CWB of its barley marketing (single-desk) mandate. In March 2008 it was revealed that Harper’s Minister of Agriculture had been asking the CWB to supply him with private and confidential information regarding farmers who sell grain through the CWB (Oct. 21/07 and again Jan 25/08). In December 2006 Harper unilaterally fired CWB CEO Adrian Measner without consultation with the Board. He followed this with a gag order on the CWB preventing them from releasing information of any benefits accrued to farmers through single desk selling. June 19/08 a Federal Court ruling in favour of the CWB made the third time the Harper Government has been found guilty of breaking Canadian laws. In August 2008 Harper’s government lifted third party spending on CWB elections. This allowed ‘third parties’ (government included) to spend unlimited funds in advertising promoting anti-CWB delegates. In CWB elections December 2010 four of five successful candidates are strong single-desk supporters (the fifth, an open marketer, won by less that 40 votes). Of the total of ten elected directors, eight are strong supporters of CWB advantages – a precedent started in 1998 with 80% of the farmer elected directors supporting the marketing advantages of the CWB. Yet, Harper and his lackeys continue their unorthodox and often illegal activities to destroy the CWB. Given Harper’s dismal record on democracy and free and fair elections is he really qualified to give Egypt any advice on elections? Free and fair elections – No Government interference.